I’m working on a hypertext fiction, a school story that draws on The Trojan Women. 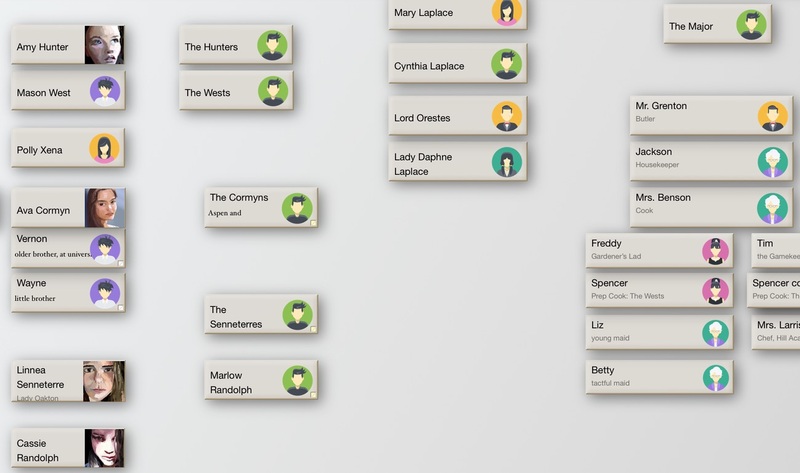 I’m using Tinderbox to keep track of the characters, and I honestly wonder how anyone manages to do this without something like it. Here, for example, are notes about roughly half the characters involved in just one chapter, which describes a summer party at a country house. This isn’t a grand wedding or a ball: it’s the late-summer weekend when our parents always invite their friends who have kids in school with us. So we’ve got six or seven kids from school, some of their parents, and a few parental friends and relatives. Some of the kids have siblings in tow, of course, and one family has an au pair. We’ve got staff, too – just enough to be convincingly grand and to provide a little upstairs-downstairs political tension: butler, cook, caterer, the gardener’s lad. To write this at any reasonable speed, I need to know what commitments I’ve already made. If Linnea’s mother is “Vic” in one scene, she ought to have the same name later on. If Cassie’s mother died several years ago, she’d better not appear at dinner. If the butler at the door has gray hair, he ought to have gray hair when he’s serving the port. An obvious difficulty with writing about young people is that young people don’t have much freedom of action; it’s hard to solve a mystery when Mom is always telling you to come in for dinner and to finish your homework. That’s one reason that YA stories have so many orphans and boarding schools. But there’s a limit; at one point, I realized that about half the class was missing a parent. Now, we can do that if we need to, but we’d need to explain it and to sell it. If all you have are brief mentions in exposition concerning minor characters, though, and they’re spread across hundreds of pages of text, it’s hard to notice the problem at all. Review the character notes, though – perhaps to decide which classmate will serve as The Messenger in a scene – and the problem is obvious. I suppose one could fill out character sheets with everything we’d ever want or need to know about each of these characters, but that would waste a lot of time. I’m not eager to write stuff that I know will never appear in the finished work: I think this house party is needed to get our characters on stage and to establish The Coming Revolution, but I worry that the whole thing may wind up on the cutting room floor. Anyway, minor characters are minor; I don’t need to know everything about the gardener’s lad, but I do need to be sure he’s not Tommy in the morning and Billy after lunch. I suppose one could do that with a notebook or a file drawer, but that feels like a lot of work.